Who's going to ask the girl with the gun if she stole that face? It's been a shadowy old week, with tech rumours, security concerns and pointy fingers emerging from all sorts of quarters. 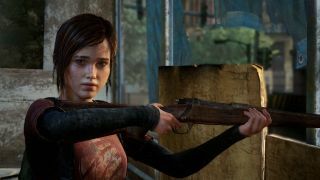 First up, Canadian actress Ellen Page accused PS3 horror game The Last of Us of stealing her face: "I guess I should be flattered that they ripped off my likeness," Page told Reddit at the weekend. "But I am actually acting in a video game called Beyond: Two Souls, so it was not appreciated." Some of us think that Ellie, the character in question, looks more like Ashley Johnson - the actress who provides her voice. But we appreciate that having what looks like your face constantly eaten off by the fungus-horned infected might be uncomfortable viewing. Elsewhere, patron saint of the internet and dread king of the world wide web Sir Tim Berners-Lee advised against complacency in the face of government and corporate "online spying", warning that ignoring Prism-style data secrecy breaches could compromise the internet's value as a vital lifeline. "Information on the web can be really important in people's survival," he said, while receiving the Queen Elizabeth Prize for Engineering. "Teenagers who are unsure about their sexuality who need to contact others, or people being abused trying to find helplines ... There are things that happen on the net that are very intimate, which people are going to be loath to do if they feel there's somebody looking over their shoulder." Speaking of digital eavesdroppers, Facebook has found yet another way to get all up in our business - through our friends. You're not even safe if your profile is a blank page, or if your last activity was defenestrating a colleague in 2005 - because it turns out Facebook can still "shadow profile" you. This involves nabbing your contact details from a friend's address book if they upload it, or recording employer or university-specific searches of your name. Facebook's behaviour is legally murky and pretty terrifying - especially since we would be none the wiser if it hadn't been for a well-timed Facebook security breach. Happily, in among all this depressing news, there are also shiny new gadgets. We took a hands-on look at the Xperia Z Ultra, Sony's new tiny-tablet-massive-phone mash-up, and we liked it for the most part, giant-screened oddness and all. Sure, with a giant 6.44-inch screen it's not for the small-handed, but the HD is impressive and the apps are super-fast thanks to its Qualcomm Snapdragon 800 chip and 2.2GHz quad-core processor. However, the camera renders grainy images and the screen quality could be improved. All in all, though, we approve of this phone-tablet. Phablet? Tablone? Sony has also unveiled the SmartWatch 2 for Android, which has an additional water-resistent screen, and packs NFC for improved synching ability. Finally, just in case you weren't cheered up enough, it looks like a viable alternative to the soon-to-be-late Google Reader is on the cards – from Digg. Digg assures us its new reader will look clean, work fast and be launched in time for us to migrate all our feeds over from Google Reader. And if that doesn't do the trick, keep an eye on TR this weekend for our round-up of the best Google Reader alternatives.